I have acquired a copy of Catalyst: A Rogue One Novel (in a game of chance) and I'm due to see Rogue One: A Star Wars Story on opening weekend. 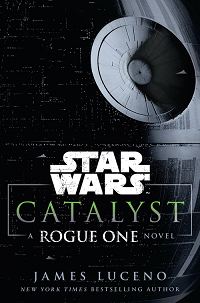 Has there been any specific advice offered (by Disney) as to whether or not I should read Catalyst before going to see the Rogue One movie? I do want to stress that Rogue One does tell the story, so I think of this book as a companion piece. This book does not set up or lead directly into the movie, but gives a much more complete picture of the relationships and how far back these relationships go, and who these characters become over the years. Her article lists some of the things that Catalyst sets up about Rogue One, which is mainly about the deeper relationships between assorted characters (something Luceno also mentions in the interview above). Whether or not you want to read the book first depends on how important you think those aspects are. Judging by what I've learned about the relationships between the films and the books (the books always include more than the films), I'd say watch the movie first and then read the book. That way you won't be "used to" everything in the book and then be disappointed when there's something covered in the book but not in the movie. Having read the book, I think it does a great job of setting up the main characters in the movie (Jyn, Galen, and Krennic) and therefore gives much more gravitas to the events of the movie. Also, personally - when I better understand what is going on my enjoyment increases. Werrf's answer here is a great summary of this. Not the answer you're looking for? Browse other questions tagged star-wars suggested-order rogue-one or ask your own question. What is the canonical range of speed a podracer might achieve? What makes Rogue Squadron 'Rogue Squadron'? Does Scarif host any resort communities?